Laser engraving is a great way to customize your gifts or products. a grey scale which allows us to create absolutely beautiful photos into the material being used creating lasting memories of your image. The lasered images into marble and granite are great for all types of memorials people and pets that will last and not fade with time. Wood engraving using a laser beam of light to burn into your wood products and gifts, leaving behind a rich color of the wood. Metal marking done with our CO2 laser, we 1st apply a product called Cermark onto the metal. When the laser beam hits the Cermark it melts into the pores of the metal giving a very durable and long lasting marking. 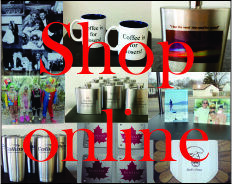 Great for tumblers like Yeti, Rtic and Flask's. With leather engraving our lasers burn into the leather leaving a rich color behind, depending on the hide of the leather and the coating the colors vary. We have one of the most powerful and largest beds in town to accommodate your needs. Click on the photos below of the products we have done for other customers to give you a sample of some of the stuff we do. This is just the tip of the iceberg.